MSM gel’s most popular use is for the temporary relief of joint discomforts in hands, feet or knees. MSM gel also finds practical application in most households as first aid in case of minor burns or cuts, as a skin moisturizer and to use as shaving gel. Provides temporary relief of joint discomforts in hands, feet or knees. MSM Skin and Facial Gel may also used for minor burns or cuts, and temporarily eliminates the intense itchiness caused by poison ivy or oak. KALA Health, Inc.’s MSM gel is based on a formula which has been used for well over ten years by Stanley Jacob, M.D. Dr. Jacob developed this gel in order to maximize the benefits of MSM in topical applications, and he has used it for many years to treat thousands of people. Dr. Jacob as offered his unique formula to KALA Health, Inc. for exclusive distribution. 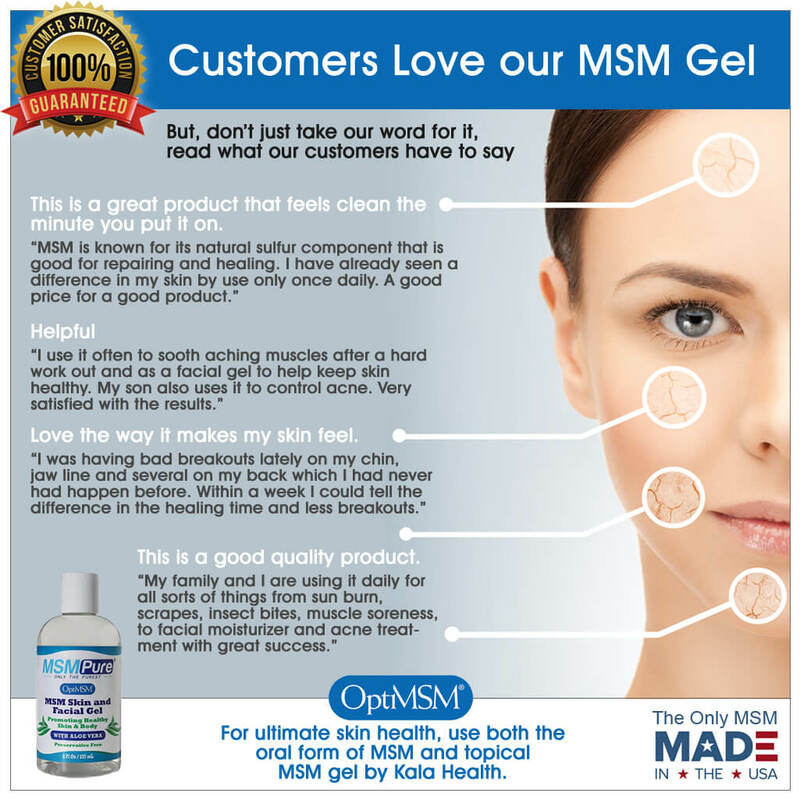 MSM gel’s most popular use is for the temporary relief of joint discomforts in hands, feet or knees. MSM gel also finds practical application in most households as first aid in case of minor burns or cuts, as a skin moisturizer and to use as shaving gel. It also temporarily eliminates the intense itchiness caused by poison ivy or oak, and, unlike medicated anti-itch creams, can be repeatedly and safely applied to large areas of the body. For therapeutic purposes it should be applied to the skin several times daily, and it works best when supplemented by 6 to 8 grams of MSM capsules per day. 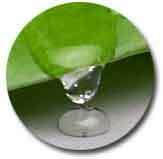 For general cosmetic purpose, it can be applied as often as desired. The gel is applied directly to the skin and should be allowed to completely dry. Wiping is not necessary. There is very little residue, and the MSM is readily absorbed into the skin. Each bottle contains 8 fl. oz. maximum strength MSM gel (15%). • To immediately and completely eliminate itching caused by poison ivy or poison oak. The skin is the body’s largest organ. It consists of a thin outer layer called the epidermis and a much thicker inner layer, the dermis. Beneath the dermis is the sub cutis which is an insulating layer of fat. These skin structures are kept together by a tough fibrous protein called collagen. Collagen works with fibers of another protein called elastin, which gives the skin its elasticity. Hair and nails consist mostly of a tough protein called keratin. The main building block of keratin is the sulfur containing amino acid cystein. All proteins require sulfur. 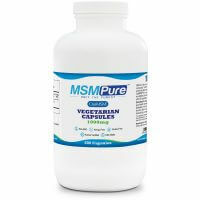 MSM is an organic sulfur-containing nutrient that supports health by providing nutritionally essential sulfur and methyl groups. MSM is a small molecule containing 34% elemental sulfur, and is readily absorbed by the skin and immediately available when applied as a gel. Collagen fibers in the skin lie in a flat crisscross pattern. Sulfur is responsible for the flexible bond between cells, including those that make up the skin. When the body is deficient in sulfur, sulfur bonds between proteins are not optimal, and cross-linking between the fibers occurs. MSM is the main natural source of biological sulfur. Topical supplementation with MSM gel helps to block the formation of cross-linking or bonding of collagen which is associated with a tough, aging skin. MSM sulfur allows the body to produce more sulfur bonds, which results in pliable, wrinkle-free skin, tougher hair and nails. 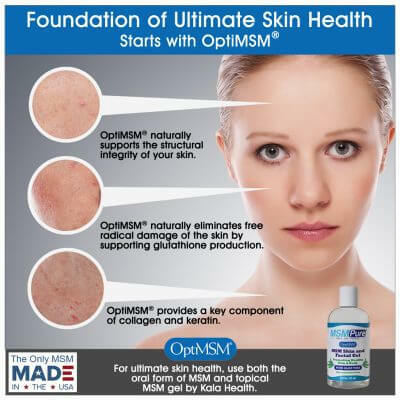 Many users report that MSM gel makes their skin smooth and the effect lasts many hours. 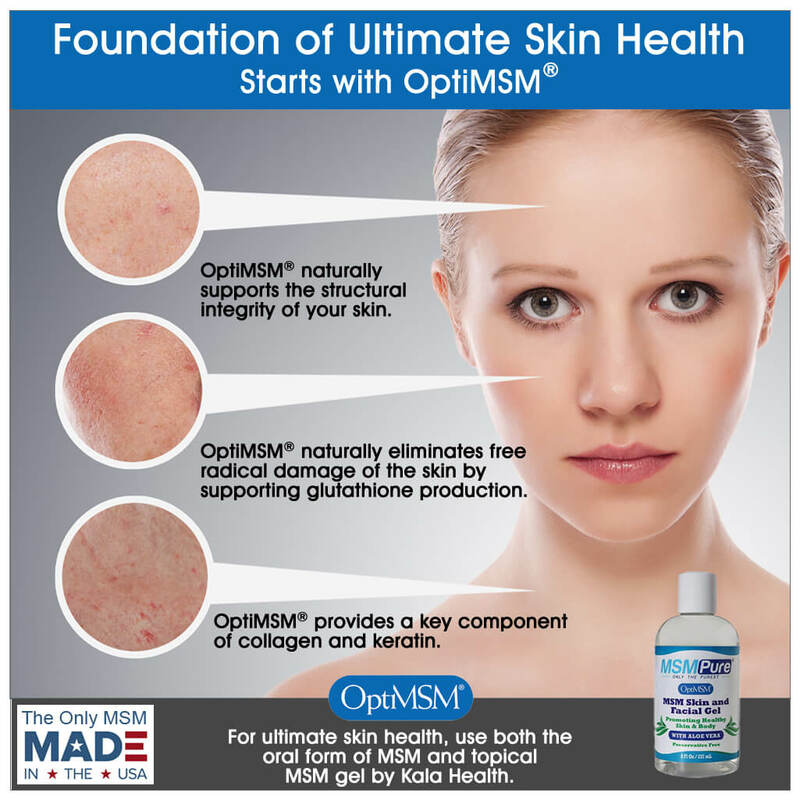 Many people find relief when MSM gel is applied to problematic skin conditions. Dr. Stanley Jacob recommends using MSM gel in combination with MSM capsules or powder. Over the years, Stanley Jacob, MD has used MSM to treat dozens of patients who had sustained first or second degree burns. Dr. Jacob has not treated third degree burns using MSM. He reports good success using topical MSM to preven blister formation in second degree burns. Many, but not all, of these patients took oral MSM concomitantly. The primary benefit is from topical application. Also, he found that the pain caused by scarred tissue and adhesions have dramatically subsided or completely disappeared, sometimes within a few days (source: MSM, The definitive Guide; 2002. Stanley Jacob & Jeremy Appleton. Freedom Press.) Dr. Jacob uses a gel containing 15% MSM, similar to the gel formula offered by KALA Health, Inc.
Deionized Water, Methylsulfonylmethane, Propylene Glycol, Hydroxyethylcellulose, Sodium Hydroxide, Citric Acid, Sodium Benzoate. Apply generously as often as desiredto skin or sore joint areas. Rub and massage deeply until dry to touch. Excess MSM crystals may be rinsed off after the gel has dried.